Friday’s game at the Rose Bowl is another checkpoint in Utah’s bid to win the Pac-12 South. 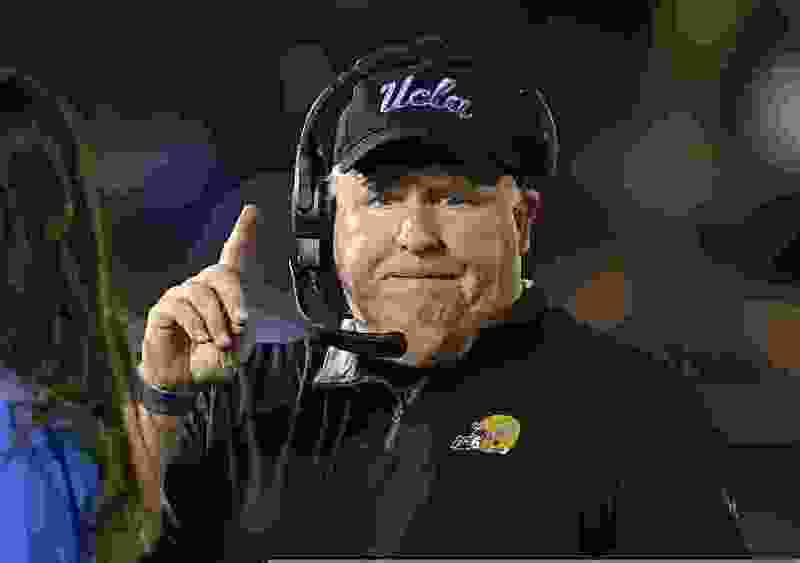 (AP Photo/Mark J. Terrill) UCLA head coach Chip Kelly gestures during the first half of an NCAA college football game against Arizona, Saturday, Oct. 20, 2018, in Pasadena, Calif. The first time football coaches Chip Kelly and Kyle Whittingham opposed each other, Oregon ended a Utah winning streak that included a victory in the Sugar Bowl. The rematch will occur nine years later at the Rose Bowl, and may help determine whether the Utes play in the Rose Bowl. There's a distinction between the stadium itself and the iconic New Year's Day event staged there. Utah will take its three-game winning streak into Friday's game, and a case could be made that building on the program's current success is more important than extending the 16-game run that Whittingham took to Oregon in September 2009. That meeting with Kelly's team, resulting in a 31-24 loss to the Ducks, came two years before Utah joined the Pac-12. The Utes go into Friday's contest vs. Kelly's UCLA Bruins knowing that winning their remaining four conference games would send them into the Pac-12 championship game for a Rose Bowl bid. A loss at any point would bring other variables into play. Part of the media’s logic for picking Utah second in the Pac-12 South this season — behind USC, with by far more first-place votes than ever — was the disheveled state of the division, with three new coaches. That has proven accurate, with changes at UCLA, Arizona and Arizona State creating an opportunity for the Utes to break through. Kelly lost his first five games, including two Pac-12 contests, evoking suggestions that the Bruins could go 0-12. But they’ve responded with wins of 37-7 at California and 31-30 against Arizona, and are only a half-game out of first place in the South. If they beat the Utes and Arizona State defeats USC, the Bruins would be on top. That's a stretch. What's fair to say is that Utah is catching UCLA on an upswing. During the Pac-12 coaches' teleconference last week, someone asked Kelly where his team was making the biggest strides. “Points scored and points against,” he said. There was no follow-up question. Call it a victory for Kelly, who's disdainful of the media, even after spending last season as an ESPN analyst. He’s apparently not humbled by his NFL experience of being fired by two teams in his return to the Pac-12, where he went 46-7 overall and 33-3 in conference games in four years at Oregon. The ’09 Utes caught him when his high-powered offense was just getting going. The Ducks posted only 318 total yards, but took a 28-10 lead in the third quarter and held on to win by intercepting Ute quarterback Terrance Cain’s pass on the final drive. Kelly's success at UCLA will occur more gradually than at Oregon. “We've got to lay the foundation for what we want to get accomplished here,” he said. That would amount to $23.3 million over five years. At the moment, the Bruins lack the offensive personnel to make Kelly look good. They rank last in the Pac-12 and 106th nationally in total offense, averaging 354.0 yards. Whittingham recognizes UCLA’s tempo, formations and running schemes from Kelly’s Oregon days, but the results are much different. And now UCLA will face a Utah defense that leads the country in stopping the run, allowing 74.6 yards per game.